Sandalphon is a relatively small Angel that can survive extreme heat (for instance, the magma in a volcano). Sandalphon excels in close combat with its agility, and has a set of razor sharp teeth. Its AT field strength is unknown. 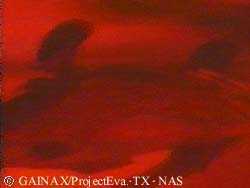 Nerv attempts to capture this Angel in its infancy which explains why it's small. As Asuka tries to capture the Angel, it awoke and began to grow. Asuka, with much effort, destroys it.